Creation: US 23 is an original US Highway, but it did not enter Virginia originally. US 23 may have come to Virginia as early as 1928, running as a duplex with US 25E from Wasioto, KY to Cumberland Gap, VA where it ended at US 411. This would also have been an addition to VA 10. Adjustments: In 1930, US 23 was rerouted to enter Virginia at Appalachia, then south through Big Stone gap, Clinchport and Gate City before heading into Tennessee. Kentucky to Clinchport was an addition to VA 106; Clinchport to Weber City was an addition to US 411 and VA 10; Weber City to Tennessee was an addition to VA 108. In late 1931, US 23 was rerouted to enter Virginia above Pound as an addition to VA 120 from Kentucky to Norton, then west with VA 11 to Appalachia where it picked up its previous routing south. The old route west of Appalachia to Kentucky remained part of VA 106 (now a bit of VA 68 and all of VA 160). US 23 to Cumberland Gap? About 1932 (bridge date), US 23 was removed from SR 727 near the Tennessee Line. 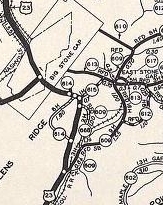 Around 1933, US 23 was rerouted to avoid East Stone Gap, leaving behind today's SR 613 and SR 609. In May 1937 (CTB), US 23 was removed from SR 693 in Pound. 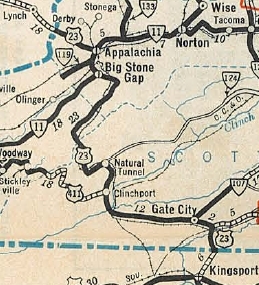 About 1950, US 23-58-421 was removed from SR 619 between Gate City and the VA 224 area. In Sept 1962 (CTB), US 23 was removed from SR 790 W. Norton Rd in the Dorchester Junction area. In Oct 1966 (CTB), US 23 was given its southern bypass of Gate city, leaving behind US 23-58-421 Business. Also in Oct 1966, US 23 was given its bypass of Pound leaving behind US 23 Business. In April 1968 (CTB), US 23 was removed from the lengthy SR 823 north of Wise C.H. In Aug 1968 (CTB), US 23 was given its bypass of Wise C.H. leaving behind US 23 Business. In March 1969 (CTB), US 23 was removed from SR 856 Railroad Ave and SR 864 in Duffield. In Jan 1970 (CTB), US 23-58-421 was placed on newly constructed road west of Gate City, leaving behind SR 870. In Feb 1970 (CTB), US 23-58-421 was placed on a new alignment (partially over SR 646) between Clinchport and Duffield, leaving behind SR 871, 872, SR 882, SR 883 and an extended VA 65. 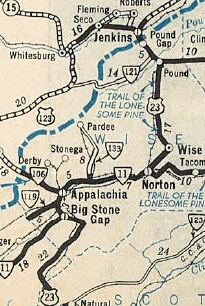 In May 1970 (CTB), the unbuilt US 23 Bypass of Big Stone Gap, Appalachia, and Norton was put into the primary system. In Sept 1970 (CTB), US 23 was removed from SR 757 between Esserville and the Wise C.H. bypass. One small bit of mainline US 23 became an extended US 23 Bus. In Feb 1975 (CTB), US 23 was removed from Lee SR 867 and the two SR 868 pieces at the railroad crossing. 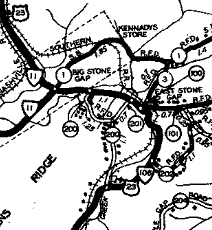 In Oct 1975 (CTB), US 23 was removed from SR 844 and SR 846 between Oreton and Big Stone Gap. In Aug 1980 (CTB), US 23 was removed from SR 667 near the Kentucky State line. Around 1985, US 23 was given a bypass of Esserville, leaving behind US 23 Business (north of today's VA 283). In March 1989 (CTB), US 23 was placed on its viaduct over the railroad tracks in Appalachia, leaving behind a piece of Main St and an extended VA 78. In Aug 1991 (CTB), US 23 was placed on its bypass of Big Stone Gap, Appalachia and central Norton, leaving behind an extended US 23 Business and VA 283. Improvements: US 23 has always been fully paved in Virginia. The First segment of US 23 to be multilaned was when it was rebuilt from Gate City to Weber City in 1950. In 1968, US 23 was multilaned on its bypass of SR 863 north of Wise C.H. In 1970, US 23 was multilaned on its Sunbright bypass. There are no remaining 2-lane segments of US 23 in Virginia. 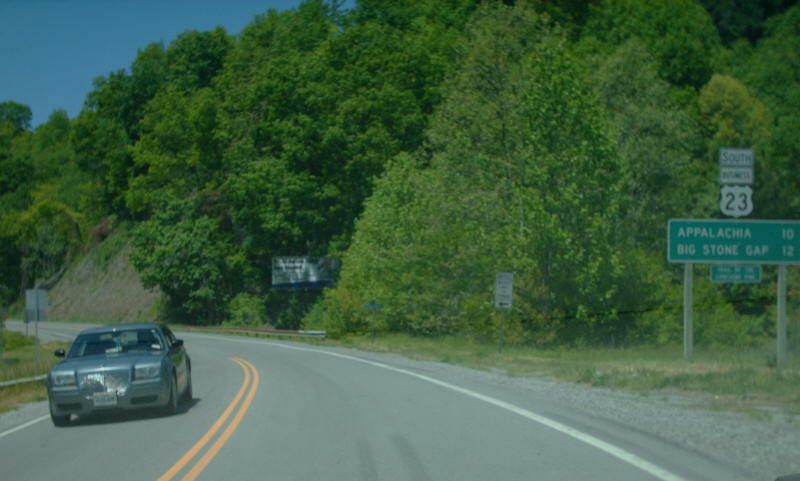 The bypass of Big Stone Gap/Norton is a full freeway except there is an at-grade intersection with SR 610 southwest of Norton. Posted: Fully posted; No known cutouts remaining associated with mainline US 23. Comments: US 23 has mile markers on its entire length, including fractional posts. US 23 is a quick, efficient drive for the most part. Not only does US 23 not have 2-lane segments in Virginia, it doesn't have any from Asheville, NC to Columbus, OH. Creation: Appeared Oct 1966 (CTB) when US 23 was placed on a new bypass around the west side of Wise C.H. This is the 1st US 23 Business. Adjustments: In Sept 1970 (CTB), US 23 Business south was extended from SR 757 to the current US 23 routing, replacing a bit of what had been the US 23 Bypass. Improvements: Paved upon inception; Multilane from Cherry St to SR 640. Posted: Fully posted; A cutout was still present NB SR 640 in summer 2009; square 23 shield was also present in summer 2009 at SR 640; white I-23 shield SB after SR 757 from 2000 has been replaced. Comment: US 23 Business did not appear on Officials until 1969. Creation: US 23 Business for Gate City appeared in Oct 1966 (CTB) when US 23-58-421 was placed on new expressway south of town. This is the 2nd US 23 Business. Posted: Fully posted; Cutouts removed in late 90s. Comment: The Gate City bypass does not appear on officials until 1969. Creation: Appeared Aug 1968 (CTB) when US 23 was placed on a new bypass around the west side of Pound. This is the 3rd US 23 Business. Creation: Appeared about 1986 when US 23 was placed on a new bypass around the east side of Esserville. it's south end was at today's VA 283. This is the 4th US 23 Business. Adjustments: In Aug 1991 (CTB), US 23 Business was extended through Norton, Appalachia, and Big Stone Gap as the new 23 bypass was completed. Posted: Fully posted; a couple cutouts remain in Big Stone Gap; numerous cutouts remain in Norton. Comment: US 23 Business is a scenic ride through these mountain communities. Previous US 23 ALT's: US 23 ALT: Appears in the June 1966 CTB Minutes as a proposed route, running from Gate City to Parsonage via VA 71, then via US 58 ALT to St. Paul, then via VA 63 to Fremont, then VA 83 to Haysi, then VA 80 to Breaks Interstate Park. This US 23 ALT would've met back up with US 23 in Shelbania, KY (current US 23/119-460 split). This convoluted route was never actually put in place, however.